Well, it's arrived, our first 650B bike, and it's in the form of the new Cube Stereo Super HPC 160 SL 650B....... bit of a mouthful we agree, but a beauty it is! Here's a few words from Michael Prell, one of Cubes R&D boffins, we guess he knows his onions about these things!! A new topic for 2013 is the wheel size 650B. How is CUBE’s approach to this? 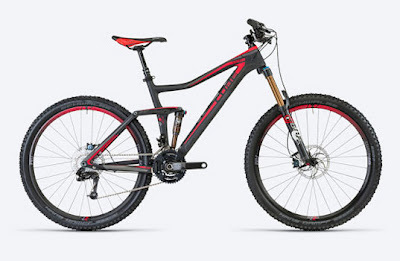 650B means a whole new dimension for mountain biking – literally. The advantages of both known wheel sizes are combined: higher speed and better rolling over bumps while delivering more travel and still showing an agile geometry. CUBE developed a mountain bike concept for the slightly bigger wheels and more than 140mm of travel with the character of a perfect trail bike: welcome to our STEREO SHPC 160.